Fancy a splash? 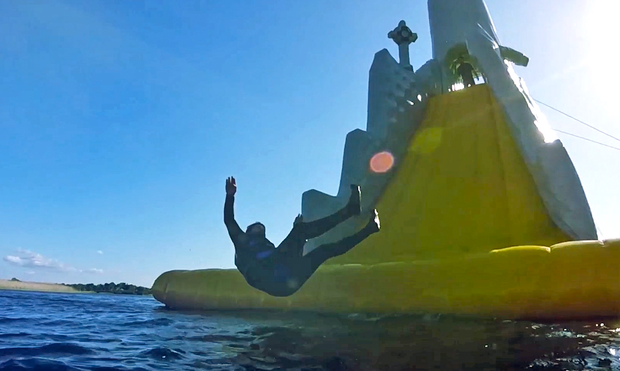 Baysports on Lough Ree is home to the 'tallest floating water slide in the world', according to Guinness World Records 2018. The floating waterpark, set next to the Hodson Bay Hotel just a short drive from Athlone and the M6, opens during the summer months for a splashfest unique to Ireland's lakes. Thrills include a 'Round Tower' slide that soars 12.5m above the water, as Pól Ó Conghaile discovers in our video. Children need to be aged six or older to hit the waterpark, though the an ability to swim is not required (wetsuits can be hired on site, and bouyancy jackets are provided). Just remember to bring a spare pair of socks! [TICON-A VIDEO] WATCH: Seven amazing Irish beaches - which will you visit next? [TICON-A VIDEO] WATCH: Center Parcs is coming to Ireland - So what's it really like?